Olawale Rotimi Opeyemi is the founder and CEO of JR Farms, an agribusiness working to transform Africa’s agriculture by providing more jobs in the sector, and creating value addition for the continent’s staple crops. A recognised young leader in Africa’s agricultural sector, Olawale Rotimi has founded and co-founded numerous impactful initiatives and partnerships in his home country of Nigeria, and across the continent, with the goal of ending hunger and creating wealth in Africa. Here, he describes some of these initiatives, and speaks on the importance of business leaders stepping up to meet the Sustainable Development Goals (SDGs). Technology is rapidly changing the nature of work across the globe. What are the key opportunities presented by agricultural digitalisation for youth in Africa? In the agriculture sector, there is a lot that technology can do. Young people are able to tap into social media, for instance, to market their products worldwide. Other platforms, such as USSD-enabled facilities, allow functionality beyond smartphones for young rural farmers to connect with buyers. Young people can therefore use digitalisation as an opportunity to solve critical challenges within the agricultural sector. The use of drones, for example, makes application of fertilisers and pesticides much quicker and less expensive. I think youths in Africa should intensify their innovative power to create more tech-driven solutions to respond to challenges in the sector. You have been collaborating with the International Labour Organization (ILO) to promote youth employment in Africa. How does JR Farms support young people to find quality work in agriculture? ILO is doing a lot of work to create decent jobs for young people. The Rural Development Academy in Egypt, for instance, was established by ILO to gather stakeholders, ministers and the private sector from across the continent, and train them on how to create jobs in rural areas. We are happy to work with ILO on initiatives like these. We are also collaborating with the Lagos State Employment Trust Fund in the area of capacity building and job creation. Through this partnership, which has resulted in agriculture being added to the State Government’s area of focus for youth empowerment, JR Farms provides young people with an interest in agribusiness with training on agricultural production, and work opportunities at the company or affiliate organisations. In Rwanda you are working with the government to improve the livelihoods of coffee farmers. How has this public-private partnership helped to maximise the impact of your work? The Rwandan Government has provided us with a platform to work with over 4,000 coffee farmers, and to roast, package and export our product from Rwanda to Côte d’Ivoire, Egypt, Japan, Nigeria and the US, among other markets. We are the first African business to have this kind of partnership with the Rwandan Government and it is one of the business’s major breakthroughs, helping us to impact on farmers’ livelihoods through the promotion of African products. The partnership has added credibility to what we do, demonstrating our dedication to Africa’s development through agribusinesses. Last year, the UN released the Sustainable Development Goals 2018 Report. What actions has JR Farms taken to achieve the SDGs and promote sustainable food systems? Over the years, we have been committed to the SDGs relating to food security, zero hunger and creating decent work opportunities for young people across the continent. One of our initiatives that demonstrates our contribution is the Inmates Farming Scheme with Nigeria Prisons, where we train prisoners in farming practices. This is a first – which I know of – in the history for Nigerian prisons, whereby inmates are able to learn new skills and access healthy meals from what they produce. In addition, we produce a minimum of 35 t of cassava for the local market each month, which is helping to solve the food crisis on the continent. Across the cassava value chain, we empower farmers by buying their produce at very good rates, while employing young people to process the crop into garri. 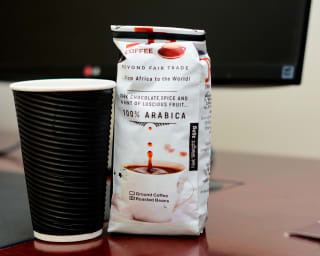 We have a similar initiative with coffee in Rwanda, and with cocoa in Côte d’Ivoire; hence, we are helping to solve problems, such as market access, post-harvest losses and poor living standards for farmers. Why is it important that business leaders like yourself step up to address global challenges like climate change and food insecurity? I started seeing the reality of climate change in 2018 when the rains stopped really early in Nigeria. The rains that came were unpredictable and insufficient to support crop growth. Food is life, so it is important that we step up to solve food insecurity, particularly in Africa where so many live off less than a dollar per day, and cannot afford to lose their harvests. Food business leaders should help develop more food security initiatives and raise the required funding to bring projects to fruition. As business leaders, we are able to gather people together to lobby government and influence policy to help access food at affordable rates, and promote greater climate change mitigation on the continent. Maduka has over 4 years experience in agricultural communication, he is an active advocate for youth engagement in agriculture and plays leading roles on this through his activities in agri-media and food processing. He is the Founder of Agrostrides Magazine and Co-founder LifePro Food Mills. Exotic EPZ is working to develop sustainable, inclusive value chains for coffee and nuts in Africa. Jane Maigua and Charity Ndegwa – two of the organisation’s three founders – have spoken to Spore about their work to support smallholders and rural women. Fayelle Ouane – managing director of SUGUBA, which is working to boost entrepreneurship in Francophone West Africa – explains why her company aims to unleash the entrepreneurial talent of youth and women. At the age of just 24, Madagascan Heritiaina Randriamananatahina heads up a cheese and syrup processing business that is growing fast. Lacking any formal qualifications, he discusses the barriers facing any aspiring young business man or woman in the agri-food industry.